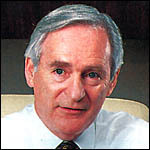 1990 Paul Lego becomes chairman in July, hires two investment consulting concerns to review financial services unit. He tells Wall Street that the company will double revenue and profits by decade's end. 1991 Announces massive restructuring of Westinghouse Credit, including a $975 million charge for loan losses. Another write off of $1.7 billion follows in October, resulting in a loss for the corporation for the year of $1.1 billion. 1992 Westinghouse cuts its dividend twice. Sells copper laminates and electrical systems divisions. Posts a $2.8 billion charge for restructuring, bringing Westinghouse Credit losses to $5.8 billion and resulting in a company wide loss of $1.3 billion. Announces plans to sell electric supply, distribution and controls, office furniture and land development businesses. 1993 Lego steps down in January.